I've been bitten by the bug and had to make a yarn wreath like everyone else. This was very easy to do. 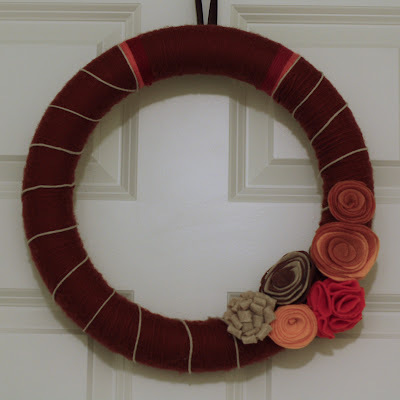 I used a foam wreath form for mine and yarn that I got from the thrift store. I managed to get almost a full skein and a huge bag of odds and ends for $3.00. I have enough to make another wreath in another color. Tutorials for the wreaths and flowers can be found in the links in this post. 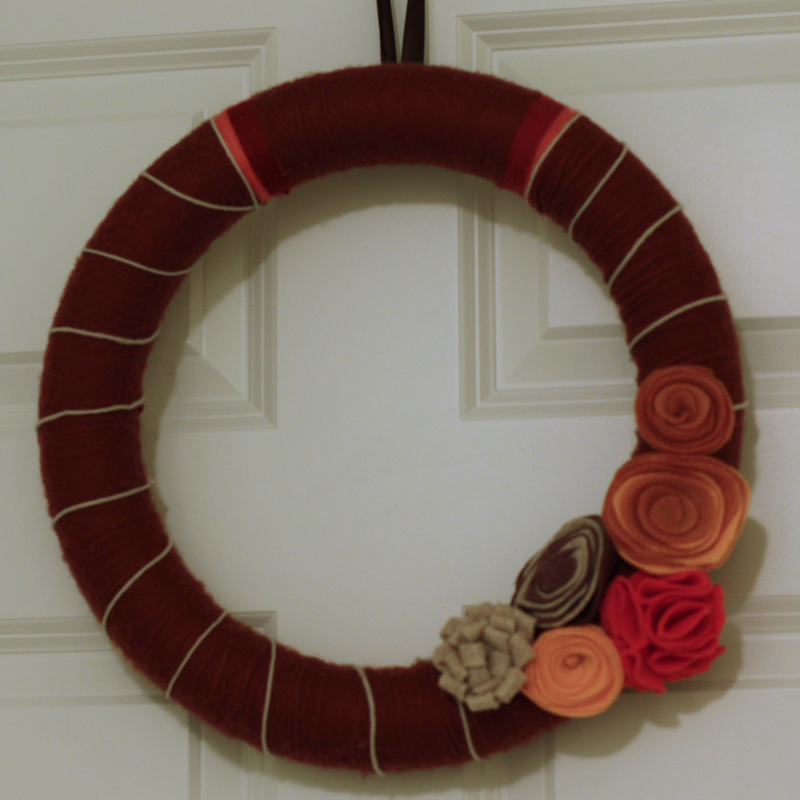 I chose fall colors but since I have a fall wreath that I made last year and my storage space is running out, I'll be shipping this one to my mom. The colors are a little off since I had to photograph this at night. The small flower to the bottom is more yellow/golden that it appears here. Thanks for stopping by, and a special thanks to my recent new followers! The colors are the perfect autumn palette! Wow that is a cool idea.... I have a craft link party at my blog http://artistneelima.blogspot.com/2011/11/crafturday-creative-mess-11-thank-you.html Do link in if it interests you. This turned out great. I have yet to try this but keep seeing them and yours is gorgeous! This looks great! I love yarn wreaths and these colors are are so warm and cozy! Super cute, great job! perfect! love it :)thanks for linkin with Tell Me Tuesday!! Love it. I have been wreath obsessed lately! I have to admit that the pesky yarn bug has been nibbling at me too! I just haven't found the time. Yours is lovely! Beautiful! All these yarn wreaths, I might just have to give in and make one too! Love the flowers on the side! If I do make one, I think I will copy those flowers petal for petal ;) Thanks for linking up with us! Oh my goodness your blog is lovely. This is my first time viewing it. 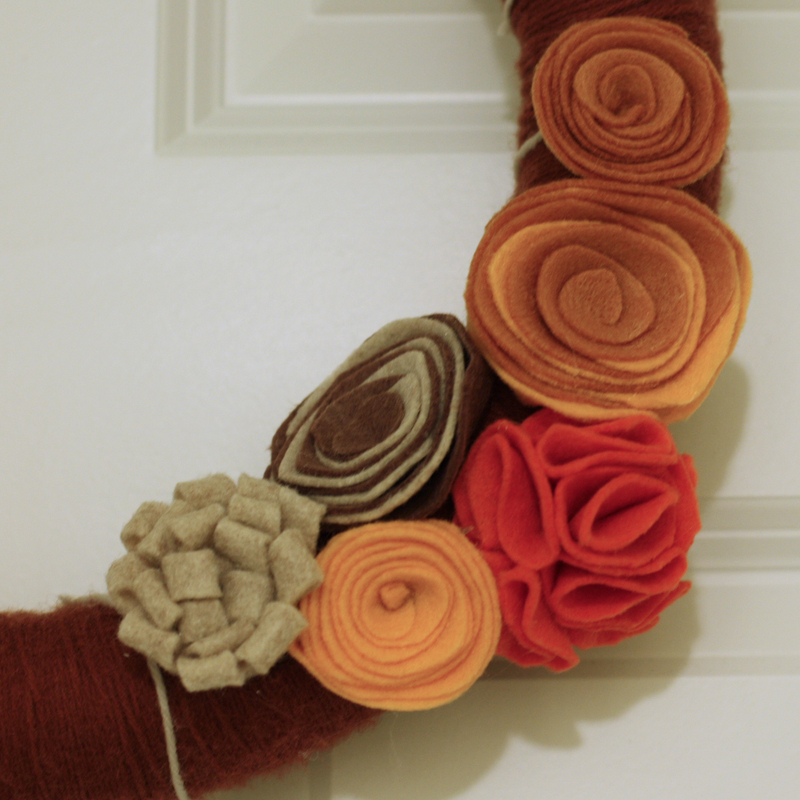 I really like this wreath too. Your music though is blaring and every time I open up a new page of your blog or look at a photo it replays. :( I look at blogs at night when my daughter is sleeping and I stream TV on a separate browser. I don't think I can keep checking out your blog. :( I even like the music but I wish there was a way of choosing if I wanted it to play.